Cousine Island is a small, privately owned, granitic island, which forms part of the inner island group of the Seychelles archipelago. 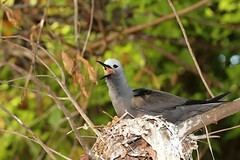 The island is both a Seychelles Seabird Group (SSG) and BirdLife partner, it is managed privately and all conservation programmes are run through the Cousine Island Conservation Trust. Cousine is managed both as a nature reserve and an Eco-Lodge and has been identified as an Important Bird Area (IBA) with seven globally important seabird species occurring on the island. The island is situated north of Praslin and Cousin; is just over 1km long, 400m at its widest point and is 27 hectares in size. In 1992, work began re-establishing the island’s badly degraded natural habitat. Following these early rehabilitation measures to the present day, the previously degraded natural areas on the island have matured thoroughly and provide important nesting sites for the ever ever-increasing numbers of breeding seabirds which have moved into the now pristine dune crest, plateau and lower forest habitats. The seabird colonies found on Cousine Island include those of the Wedge-tailed Shearwater (Puffinus pacificus), Audubon’s Shearwater (Puffinus lherminieri), White-Tailed Tropic Bird (Phaethon lepturus), Brown Noddy (Anous stolidus), Lesser Noddy (Anous tenuirostris), Fairy Tern (Gygis alba), Bridled Tern (Sterna anaethetus) as well as the Sooty Tern (Sterna fuscata). In addition to these seven species, another two colonial seabird species namely the Red-tailed Tropic Bird (Phaethon rubricauda) and the Roseate Tern (Sterna dougallii) have been recorded breeding on Cousine Island, albeit not consistently every year. All of the seabird species listed above have been monitored in some form or another since the island was purchased by a South African businessman and conservationist in 1992. Some species such as P. lepturus and G. alba are monitored throughout the year, while the other seasonal breeders such as A. Stolidus and A. tenuirostris, are monitored only during their breeding seasons. Two comprehensive seabird censuses are conducted every year, one in February during the North-West Monsoon and one in July during the South-East Monsoon. During these surveys, the following species are enumerated; P. lepturus, A. stolidus, A. tenuirostris, G. alba, and S. anaethetus. Although they have not been monitored recently, both P. pacificus and P. lherminieri are also monitored seasonally during specific stages in their breeding cycle. The monitoring of the latter two species is done by the “call-back method” and will be conducted on Cousine Island during their current breeding cycle. In addition to the above comprehensive monitoring, two of the above species are specifically monitored for breeding success during the South East monsoon, namely; A. stolidus and A. Tenuirostris. During this monitoring 150 nests are randomly selected in order to monitor the average success rates from a complete active nest to a successfully fledged chick. Two very important seabirds on Cousine Island breed all year round, and are thus monitored for nesting success and nest site fidelity all year round in addition to being monitored ‘once –off’ for during the two main censuses. The species monitored in this manner are; P. lepturus, and G. alba. This type of monitoring is vitally important as it plays a role in augmenting the population data collected during the two main seabird census periods. The conservation of seabirds on Cousine Island and on all of the Seychelles islands where seabirds actively breed is an extremely important activity for numerous reasons. The primary goal of the programme on Cousine is twofold: Firstly, any meaningful or drastic changes in seabird populations, breeding performance, diet and other variables are detected early on. This in turn provides an early warning system which indicates any negative trend which could relate to larger problems such as: introduced predators; major human disturbance and any other factor affecting seabird populations and habitat quality adversely. Lastly this data constitutes a measure of a species success which is comparable from one island to another. On a more optimistic note this monitoring can also be used to track positive changes such as vegetation re-growth, habitat restoration initiatives and even the overall efficacy of current conservation practices. In conclusion not only are seabirds a pleasure to observe and capture photographically, but they also provide an extremely valuable insight into the “health” of the surrounding ocean and ecosystems and can become valuable when tracking effects such as climate change and overfishing over longer periods of time. To make contact with the Island or the Island conservation department you can use the following contact information. Alternatively follow us via our official website, conservation diary or look us up on Facebook.